Measurements: 2.73 x 4.73 inches, or 69 x 120 mm. Back of card: A dark blue sky with lots of little yellow stars, with a white border. May be inverted. I think US Games has used this back elsewhere. Booklet included: Yes, 46 pages, 2.55 x 4.55, or 65 x 116 mm. English. Introductory notes by Stuart Kaplan, instructions excerpted from The Key to the Tarot, by A.E. Waite. Publisher: US Games. Printed in Italy. Comments: In the booklet, these cards are said to have been Designed by Pamela Coleman-Smith under the direction of Arthur Edward Waite. Virginijus Poshkus is merely credited with recoloring, but if you look closely, you will see the cards have, in fact, been redrawn. This is most obvious on the Lovers & Devil cards, where the men have been desexed. As desexing males in tarot decks has previously been a quirk of female artists, I did a net search to see which gender Virginijus might claim. I could find no better than a reference to Virginijus as a female, which will have to do. She seems to be a house artist at US Games. It may be that I make too much of male genitalia. I remember student artist days, when I had to draw the female figure. While I could do great perspectives & very good mechanicals, the human figure eluded me. With females, I had a problem making them really female, but then, I never got anywhere close to being professional, and I never offered my work for publication. Which is to say that when immature people are embarrassed by the opposite gender, their art has quirks. I will always wonder what is gained by depictions of neutered humans. It certainly will never go unnoticed. Of the various "enhanced" versions of the Rider-Waite, this is very good. 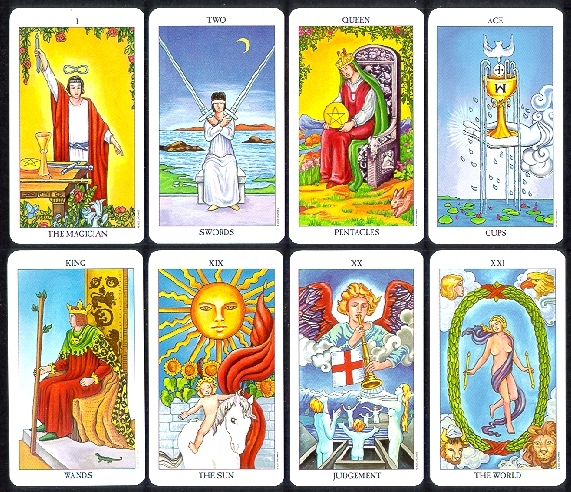 Others to consider are the Diamond Tarot, the Golden Rider & the Universal Waite.